Collins Injera scored his 254th try on the HSBC World Rugby Sevens Series on Sunday against New Zealand, his brace earning Kenya a finals berth in the Hong Kong Sevens where they will face Fiji. Amanaki Nicole got All Blacks rolling with an early try that was converted by Rocky Khan. Collins Injera struck a brace to hand Kenya a 14-7 half time lead. Willy Ambaka confirmed the win with a second half try.Sammy Oliech made all the three conversions for Kenya. New Zealand tried a late come back but Jona Nareki could only alter the scoreline to 21-12 in favor of Shujaa. Fiji won 26-24 against South Africa in the other Semis for the final’s slot against Shujaa. 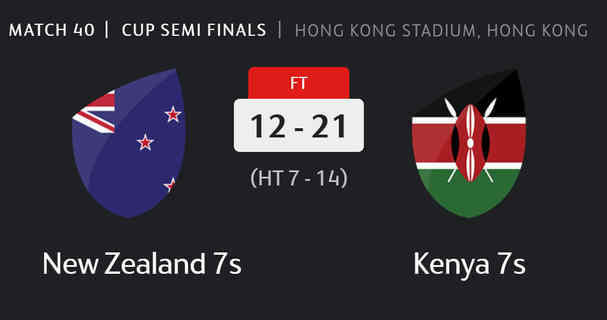 This is the first time Kenya is making the finals in a row after a similar feat in the Vancouver Sevens where they lost to Fiji 31-12 in the final.